We are at the end of term 3 school holidays here in Sydney. For the past two weeks while the catering side of the business goes into hibernation I have been teaching kids how to cook and we aren't just talking cupcakes! For most parents, school holidays is a bit of a pain in the behind because sadly our working day is the same as ever and no matter how you dress it up, no boss I know would say 'kids are off school? no worries- take the week off and enjoy!' So, like most parents out there I also need to find something for the young Max to do all day (Alex is still in day care so that takes care of that....for a few more months anyway). The classes were a great success I am happy to report. Ok, if the truth be known, 9am till 3pm is a LONG day when you have 14 kids all wanting to be master chefs ranging in ages from 6 to 13, but we did it and got a lot of repeat business so that in my books is a huge success. 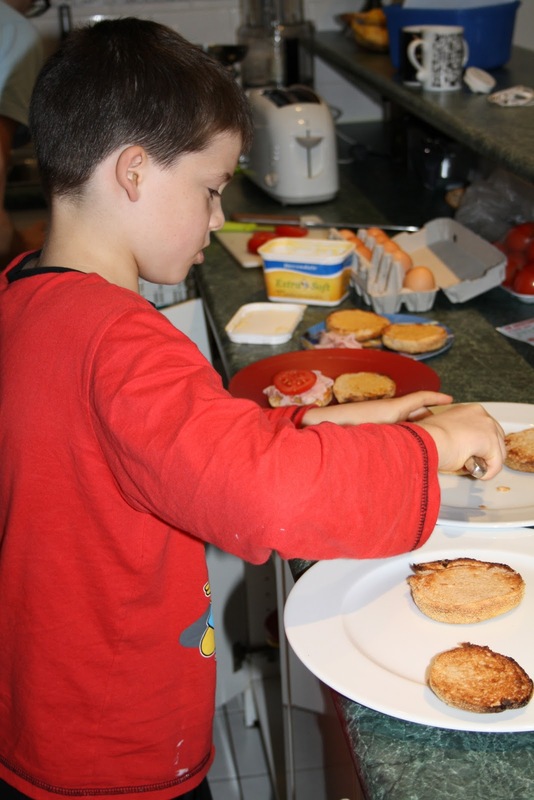 Max did all the classes and I could see a gradual improvement in knife skills, following directions and confidence in the kitchen. So confident in fact he wanted to cook just about every night. This was all well and good but after 6 hours of teaching with 14 kids I really didn't want to have to guide another child through the kitchen when I finally got home (call me a meanie but I was buggered!). So this morning, after a couple days rest I asked Max if he wanted to make breakfast for the family. "Oh yes......but will you be there?' Of course I said, and with that he proceeded to pull out his recipe card on how to poach eggs and got to work. The concentration was intense, but those English muffins we buttered to perfection! End result? fantastic!! 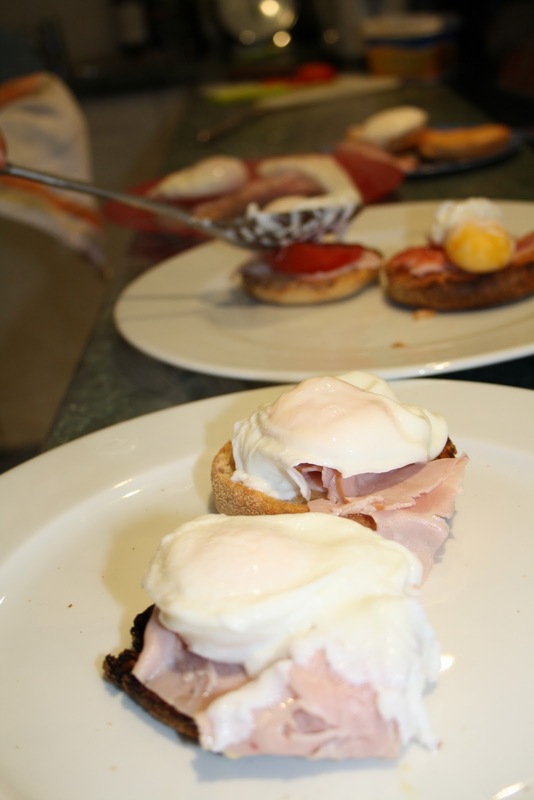 Max did a brilliant job of making poached eggs with ham and tomato on an english muffin. Only one egg had a bit of a separation issue, however after sorting out the problem you'd think these poached eggs were cooked by a seasoned professional. It looks like I am one step closer to getting breakfast in bed. Great Job Max! I don't trust many seasoned chefs to make eggs for me (especially poached) and yours look perfect! Good Show. Oh! Thanks for checking in on me. I had a heck of a work week it is nice to know care. Tell Max he can come cook breakfast for me any day! Poached eggs are my fave. Gosh whenever I have a noisy poke at your blog I am always left salivating! How are you!? We are coming to Sydney over New Year,will you be around to meet up? WOuld be nice to have a catch up. Do you live far from the city? Indeed, Max did a brilliant job, I see! I love poached eggs from time to time! I'm impressed--I have trouble poaching an egg properly! Max did a terrific job!